The Bailey Olympus range of seven new models is the second of the company’s ranges to feature the ground-breaking Alu-TechT body shell, the most significant development in caravan production technology for over thirty years. Dave and Liz King trudged through snow and bitter winds to see them. 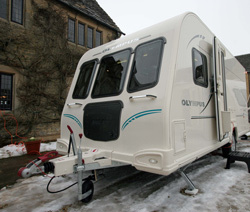 Alu-TechT gives users a market-leading ten year body shell integrity guarantee, subject to certain conditions, and Grade III Classification of Thermal Insulation (EN1645-1) giving a greater opportunity for Olympus owners to caravan all year round in more comfort with body shells 30% thicker than in classic construction methods. Given the weather, the caravans certainly felt welcomingly warm; all that was missing was a glass of Mulled Wine to wrap our hands around! Alu-TechT has been proved in extensive tests to offer a more stable shell with the weight concentration nearer the centre of the caravan and gives improved fuel economy; 10% improvement has been reported and with fuel prices rising, that’s a significant cost saving. Alu-TechT has already justified itself since its launch in October at the NEC with the Pegasus range, seven of the top ten selling models at the show were Pegasus models; over 1000 retail orders were generated in the first five weeks. The Bailey Olympus joins the portfolio and sits with Pegasus, Pageant, Ranger GT and Ranger models; the market will dictate the future of the Pageant range and the Senator range has recently been discontinued. A standard 7ft 2 ins wide body shell differentiates Olympus from Pegasus offering the mid-market consumer the benefits of Alu-TechT bringing cutting edge technology within easy reach of more customers. Headroom is 1.96m (6ft 5ins) throughout thanks to the flat panel roof construction. The kitchens feature a rectangular sink with a chopping board, washing up bowl and separate drainer, a microwave, four burner gas hob and an oven with separate grill and a Thetford 107L fridge. Combined with Pear veneer contemporary furniture, high gloss laminate work surface in the kitchen, matt nickel accessories, fabric magazine racks on the walls, two Heki roof lights and battery friendly low voltage lighting we think the Olympus is practical and user-friendly. Product specification includes the AL-KO ATC Trailer system, AL-KO AKS hitch, Al-KO shock absorbers, Al-KO Secure prepared axle (the lock is an optional extra), Radio/cd/MP3 player with IPod connectivity and branded dual cone stereo speakers, flush fit Polyvision clear windows with integral water management system, LED awning light with integral water management system, LED illuminated grab handles, twin wet lockers and supplementary wheeled water container. Caravan Guard expect their caravan insurance prices to be competitive for the Bailey Olympus range with a 5% discount for AL-KO ATC available and also a 10% discount for owners who buy the optional lock for the AL-KO Secure axle wheel lock. Insurance premiums from as little as £206*. 462 – 2 berth with transverse washroom. 464 – 4 berth with fixed offside double bed and side washroom. 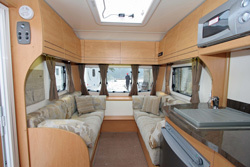 504 – 4 berth is a new layout with a transverse washroom and two separate living and sleeping areas. 525 – 5 berth with centre kitchen and washroom. 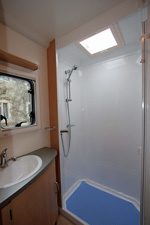 534 – 4 berth with fixed nearside double bed and transverse washroom. 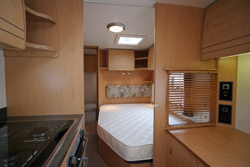 546 – 6 berth with centre kitchen and washroom and sleeping/living areas at the front and rear of the caravan. 624 – 4 berth twin axle fixed with nearside double bed and transverse washroom. The full range will be on show for the first time at the Boat and Caravan Show at the Birmingham NEC from 23 to 28 February 2010 (Hall 5 Stand 5292). Recommended retails prices including VAT start from around £13,500 for the 462 and top out at £15,500 for the 624. 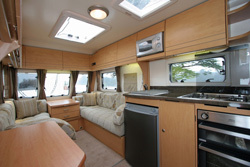 *Caravan insurance cost based on the Bailey Olympus 462 valued at an estimated price of £13,500, fitted with hitchlock and wheelclamp plus AL-KO ATC and AL-KO Secure wheel lock (standard on this model). Kept behind 24 hour locked gates in HX2 7RZ. Caravanners over 30, caravanning club members with no claims in last 3 years. Inclusive of Insurance Premium Tax at 5%, includes an online discount of 10% and correct as of 26.01.10.